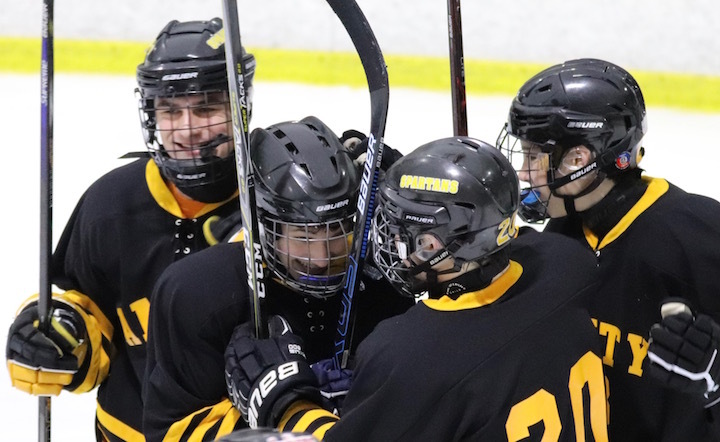 Coming off of an awesome victory over NFI last week, the Amity Spartans Ice Hockey team was feeling confident and ready to go at their second regular season game on Saturday, Dec. 15. This game against the Milford Indians at the Milford Ice Pavillion was reminiscent of televised NHL games in the 80s, with a ridiculous list of penalties in which the home team (Milford) accumulated 9 to Amity’s 7. The game got off to a quick start with Amity’s Nelson Bordeleau getting one in just 3:52 into the first period, assisted by Cody White and Ed Martino. About 8 minutes later Milford’s #14 (name unavailable) tied the game off an assist from #11 Kosh. Martino quickly answered by scoring Amity’s second goal, assisted by Jason Csejka. First Period Score: Amity 2, Milford 1. Just 3:28 after returning to the ice, Tommy Schittina made a goal for Amity, assisted by Bordeleau and Justin Miller. Then 10 minutes and several shots later, White scored off a Martino assist, bringing the Spartans lead to 4-1. Moments later both #20s, Amity’s Ken Page and Milford’s Ubaldi, were sent to their respective penalty boxes for roughing with only 50 seconds remaining in the second period. It took a while for the third period to get going since so many penalties were being handed out. In the first 10 minutes we saw slashing, cross-checking, high sticking, roughing, tripping and unsportsmanlike behavior. with players from both teams spending time in the box. Finally, at 10:19, White scored off an assist from Csejka. It only took three minutes for Caleb Marcin to find the net, assisted by Csejka. I hope you didn’t blink, because, within seven seconds, Dylan Raver swooped in and scored on White’s assist. This was an exciting game, the Spartans really showed what they had to offer. With a 7-1 victory, the Spartans are now 2-0 for the season. Amity Head Coach Michael Richetelli said Milford did its job and his Spartans had a great day. Many of the new, younger players got ice time and did very well. Fans are recognizing that the Spartans are playing like a seasoned team that’s been together much longer than just a couple of games. We all have high hopes that we’ll see them go all the way to the states this year. Yes, they’re that good.